Going through the dolly wardrobe is a very bad thing sometimes. It gives me the opportunity to consider what I have more of and what I have less of and this is not a good thing because then I see that my dolls have a lot of shoes (which I already knew) and a good amount of dresses… And then I see that they need more tops, in particular non-knitted things (I knit a lot!). And then my dolls also have a severe lack in pants, shorts and skirts. I did recently acquire another pair of pants for the girls, so that’s something. But I’m also in the mindset that I need to downsize because I just feel like it’s a lot of stuff. Yet, at the same time, it’s really hard to downsize unless you’re really looking at everything with an incredibly critical eye because there’s just so much stuff there that I begin to lose sight of what’s important with my hobby. And what’s important is that it makes me happy. Anxiety over having stuff doesn’t make me happy. The feeling of being overwhelmed doesn’t make me happy either because that’s just not good for me. 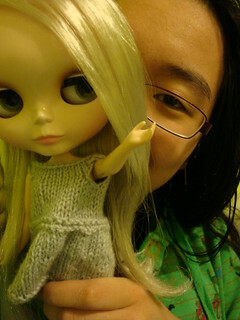 It really did take a moment for me to realize that I just need to spend more time with my Blythes. For the most part, despite the internet interactions, it can be a really solo hobby. I spent my first two years in the Blythe hobby only interacting with fellow enthusiasts online. And then Portland happened and now I’ve got a pretty solid group of people to spend time with and talk about dolls with. It’s amazing and very awesome. What I really need to do, and that I’ve kind of forgotten, is that I just need to spend time with the dolls. I got incredibly burned out after doing 365 and while I’d love to do it again, I don’t think school is going to allow for that in the future. I got caught up with the stuff that I lost sight of what was the important part of the hobby for me, and that was the dolls and just the comfort that they bring. My Blythes need more of me. Question of the Week: Do you like the Littlest Pet Shop Blythes?